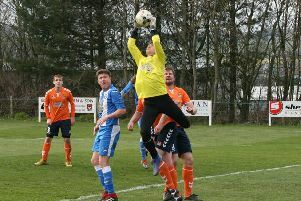 Duns were always playing catch-up when they faced promotion-chasing Ormiston at New Hawthorn Park on Saturday. After the very heavy overnight rain on Thursday members of the clubs committee spent Saturday morning on the pitch undertaking remedial work which proved successful in making the recently rejuvenated pitch playable at a time when other games were lost to waterlogging. Both sides entered the field of play knowing the stakes were high and both spent the first quarter of an hour testing each other out with Ormiston getting into their stride first, opening the scoring in the 15th minute. It was a lead they only maintained for six minutes until a bustling Jordan Lauder drew things level. However, the home side had barely got used to the idea of being level before the visitors retook the lead in the 21st minute. It was that man Lauder again who squared things up after 34 minutes to take the teams into the dressing room at 2-2. He pounced on a loose ball after the visiting keeper parried a shot from Shennan. In truth the opening half had proved a test for Duns who at their best had just managed to keep up with a hungrier looking Ormiston side. The second half commenced under a brightening sky, on an afternoon perfect for football with not a breath of wind. The NHP surface was showing itself to be well up to the climatic challenges in this the third home game on successive Saturdays. As has so often been the case this season, Duns commenced the second period in second gear with the visitors taking advantage of their hosts lethargy going ahead for the third time in the game six minutes after the restart. With 16 minutes remaining on the clock the visitors added to the home side’s pain with a fourth goal. To their credit, Duns did press on but it was always a bridge too far despite half time substitute Conor Deveney finding the net with a neat header in the first minute of stoppage time. All credit to Ormiston on the day as they opened up a six point gap although Duns straw still to be clutched at is their two games in hand over the side from East Lothian. Duns: Tansey, Burns ( Weatherburn 45), Renton, McHoul, Windram, J Brydon, Robinson (Waddell 45), Stewart (Devaney), Lauder, Shennan, Wales.